Posted on May 9, 2017 by Greg Kaz. Do you have a roof that has seen better days? Does it need a repair in the near future? If so, make sure you have the job done with EPDM for the reasons we’re about to cover. Are EPDM Rubber Roof Repair Services for Me? In short, yes. There are very few situations where you couldn’t immediately use an EPDM Rubber Roof to repair the damage to yours. It would be a truly unique scenario. That’s because this material works with all other types and can easily be applied to vertical surfaces, too. A common exception is if your roof is so damaged that structural problems need to be addressed first before EPDM can be used to add a strong, finishing touch. Every year, people will fix their roofs with materials that are only going to give in again the next time the weather takes a turn for the worse. This happens at both extremes of the climate spectrum. It’s also one more reason to opt for an EPDM rubber roof repair service. This material has been tested time and time again in extreme weather that you’d never even need to worry about. While every type of EPDM is different, certain versions have been submitted to -40-degree temperatures before becoming brittle. There have also been types that were targeted with 240 degrees of heat for 4 weeks straight and didn’t break. While we all want to do what is best for Mother Nature, there’s no getting around the fact that this often means sacrificing quality during an important job (e.g. roof repair). Fortunately, an EPDM rubber roof repair job will be both environmentally friendly and worth every penny. Much of EPDM is made from post-industrial recycled products. The manufacturing process also requires very little energy when compared with other popular options. Several other chemicals that are required for the installation process (e.g. primers, cleaners, adhesives, etc.) are made to help reduce VOC (Volatile Organic Compounds). Furthermore, there’s the simple fact that EPDM installation doesn’t require any processes that are going to endanger the environment. Aside from the fact that an EPDM rubber roof repair job is going to be environmentally friendly because of the actual chemicals involved, there’s also the fact that it greatly reduces the amount of air that seeps out of a home once it’s installed. This is what tends to happen when you turn on your air conditioning or heat. Much of it is escaping through the roof. EPDM keeps a seal on it that won’t allow this to happen. It also blocks out the sun’s rays, so you don’t need to pay for more AC during the summer. Another benefit is that your carbon footprint remains minimal. It also helps that this will greatly reduce your utility bill, too. You’ll actually save money over time by investing in EPDM now to repair your roof. If you have a roof that could use some help, don’t miss out on the opportunity to use EPDM to get the job done. For all of the above reasons and many more, it’s the best product on the market for this kind of work. Posted on November 16, 2016 by Greg Kaz. Repairing roof leaks, or even replacing the entire roof is something that every homeowner will need to face eventually. While investing in a high-quality roofing system at the outset will help stave that time off, it will happen sooner or later. When it does, it pays to know the right repair or replacement option. You can certainly repair or replace your roof with the existing materials, but more and more people are turning to rubber roof coatings for their many benefits. What should you know? What Are Rubber Roof Coatings? If you’re like many homeowners in the US, you might think that rubber roof coatings are really only applicable for businesses with flat roofs, or those with cement underlayment that needs to be protected from ponding water. While these coatings certainly do play a significant role in commercial roofing projects, they are also good fits for residential needs. Really, rubber roof coatings are exactly what they sound like. They consist of a bucket of liquid rubber, which is usually mixed with a catalyst to incite the curing process, and then applied to the roof of your home. Depending on the actual product you’re using, you may need anywhere from one coat to three coats or more. Liquid Rubber allows you to apply just a single coat, saving you time and money. Are Rubber Roof Coatings Really Waterproof? Yes, rubber roof coatings are waterproof, although the time it takes for them to become so varies from one product to another. Liquid Rubber roofing is waterproof as soon as it is applied, but others on the market are not. Liquid Rubber is actually a liquidized version of EPDM, the same type of rubber that you’ll find under the hood of your car, in the shape of radiator hoses, or sealing water away inside your refrigerator, in the form of gaskets. It is high-performing, and 100% waterproof as soon as it is applied. Water-based systems cannot offer that. What Types of Roof Can Benefit from Rubber Coatings? Really, just about any type of residential roof can benefit from rubber roof coatings. However, depending on the type of roofing material yours uses, you may need to apply a coat of primer before applying the rubber roofing. Metal roofs with the exception of sanded stainless steel will not need primer, but conventional asphalt shingle roofs will need primer applied. You will also need to ensure that any rips, cuts or tears are cut away so that there are no cracks in the primer prior to applying the Liquid Rubber. While there are plenty of competing rubber roof coatings on the market, only Liquid Roof offers immediate waterproofing. In addition, it is the only product that can be applied with only a single coat, saving you both time and money. In fact, it is so simple to apply that many homeowners choose to do it themselves and save money rather than hiring a professional. Posted on April 6, 2016 by Greg Kaz. When you think of rubber, you may not think about the roof for your commercial building. Instead, it’s more likely that you imagine the tires on your car or maybe the rubber bands you have in your desk. Whatever the case, the point is that if you want the best protection for your building, it begins at the top and it involves using liquid rubber. The type of rubber we’re talking about here is a synthetic version called EPDM. Ethylene propylene diene terpolymer can be used for a number of different things, but the reason people have begun applying it to roofs is the durability it provides. It also helps that the application process ensures every last square inch of the roof gets the coverage it needs. While it may not seem obvious, your roof actually moves. As the seasons change, it will actually contract or expand slightly depending on the temperature. This is an important fact to grasp because it helps explain why EPDM Rubber has become so important as a way of adding extra protection to roofs. Any material that isn’t applied as a liquid coating can’t compare because it also can’t move with the roof. When it expands, the defensive measure will be left behind. When the roof contracts, the material can actually crack or otherwise become damaged. This is supposed to be your defensive measure! EPDM will move with the roof, providing coverage at any size and never cracking just because the top of your building contracts slightly. On top of that, EPDM will hold up to extreme temperatures better than anything else. Put simply, it will maintain its structural integrity should the temp ever drop to 40 degrees Fahrenheit or even if it gets up to 300. Is it likely that will ever happen? No, of course not, but those numbers definitely speak to how much liquid rubber is able to fend off. Whether your building is located where it snows year round or in a place that the sun beats down upon nonstop, your roof won’t become compromised. Protecting your roof from the elements really isn’t a luxury option you can afford to consider. It’s something you must absolutely do or even the smallest leak could end up costing you dearly. Unfortunately, traditional methods for doing this can hit your budget hard. One of the main reasons liquid rubber has taken the industry by storm is because it won’t make you choose between the wellbeing of your building and half your budget. Not only is the material affordable, but having professionals apply it for you is far cheaper than the other options out there. You don’t need heavy machinery or long hours and there isn’t the loud noise that usually keeps away customers. Don’t take chances on the future of your roof. Instead, use EPDM to ensure it is able to keep the outside world at bay and protect your money at the same time. Posted on September 8, 2015 by Greg Kaz. If you’re a commercial property owner or if you own the building in which you do business, you know firsthand how expensive it can be to keep a retail storefront or an office suite in good physical condition. One of the biggest maintenance costs is ensuring the roof over the heads of your employees or your tenants is in good condition. There’s a number of choices open to you when it comes to repairing or replacing an old commercial roof. Sometimes selecting one of these options from an entire field of choices can be frustrating; however, if you’re looking for the best option when it comes to overall cost and durability, there’s only one choice you should be looking at: an EPDM rubber roofing system. Named after the three main ingredients that go into its construction – ethylene, propylene, and diene monomer – EPDM is an extremely thick and durable rubberized roof covering that’s used exclusively in commercial settings. The synthetic rubber created in the process is quite resilient and often outlives the buildings it’s fitted to, as it’s easily recyclable into roofing tiles or material for walkways. The roofing system is available in both black and white, and while EPDM can be installed on roofs with any pitch, the roofing material is especially ideal in commercial buildings with flat or lower-pitched roofs. Originally developed in the 1970s, the technology behind EPDM itself hasn’t changed much over the decades since. However, the application methods used by roofing contractors have progressed since the inception of EPDM roofing, making an already easy installation process that much easier with newly-developed tools and techniques that streamline the process. The biggest advantage that EPDM has is its incredible durability. A single application of the roofing solution can last as long as 40 years or even longer with regular maintenance, thanks to how resistant the synthetic rubber is when it comes to degradation caused by prolonged exposure to heat, cold, and other environmental conditions like hail or even ultraviolet radiation. When white EPDM is used on a roof, it even helps to keep the building’s temperature control costs down thanks to its ability to reflect a large quantity of the heat it would normally absorb on a long day baking in the sun. The final advantage to using EPDM as a roofing material – and perhaps the one that most appeals to money-conscious landlords and business owners – is that thanks to its durability and already affordable price, an EPDM installation is an excellent investment in the future. With the roofing material lasting nearly half a century without significant degradation – and with little to no maintenance needed except for general good housekeeping – the cost of an EPDM roof is an excellent investment in the future for any low-sloped commercial building. In fact, it might be the only roof you’ll have to buy for your business in your lifetime. Posted on December 22, 2014 by Greg Kaz. It’s never fun realizing your recreational vehicle has a leak in it. When RVs are working properly, they offer practically unlimited freedom to those who enjoy them. Anywhere the open road can take you is an option and you always have a place to stay that fits your needs perfectly. That being said, RV roof repair is sometimes a necessity. However, if you use EPDM to do it, you’re practically guaranteed you won’t ever have to do it again. To begin, make sure you address the leak first and any damage it has done inside the RV. Sometimes, this will entail handling any issues the leak may have caused with your electronics. Whatever the case, EPDM is an excellent choice for RV roof repair because it will cover the damaged area sufficiently. That being said, you still want to take care of any underlying problems it may have caused. Next, use one part bleach to three parts water and a stiff broom or some type of scrubber to get rid of any stains on top of your RV that the leak may have caused. This will also help with your RV roof repair project because it will ensure the EPDM has a nice, clean surface to apply itself to. Other products are made for RV cleaning to, if you don’t want to mess with the mixture. Then be sure to dry the roof sufficiently. Direct sunlight helps a lot, but go over it once with a towel too. You can also find primers made specifically for using EPDM for RV roof repair. This is the initial step you’ll take as soon as your RV’s roof is nice and clean. Simply follow the instructions on the bottle. Before you apply the EPDM for your RV roof repair project, remove any skin that may have formed at the top. You can use a simple roller to coat the area, applying it as a ¾’’ coat. Again, read the instructions to know how long you should let it cure for. Typically, this takes no more than three days, depending on what kind of temperature you’re experiencing. Then apply a second coat, but roll it out in the opposite direction. If you’re using a rubber form of EPDM, then it will come in sheets. The instructions will tell you how to apply it, but chances are you’ll cut off as much as you need and then roll it over the leak. One sheet should be enough. There will most likely be an adhesive to then roll over it, in order to secure the seams. 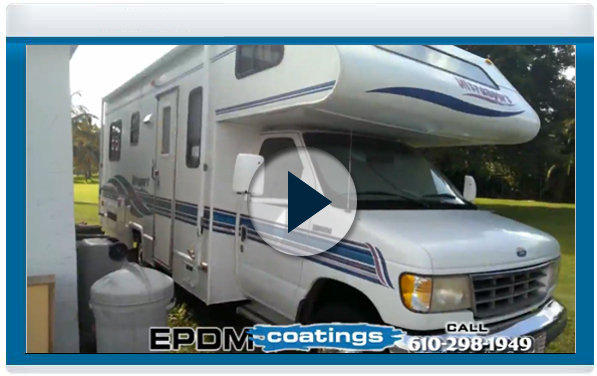 No matter what kinds of RV leaks you repair, EPDM is the way to go. Just make sure you do it when the weather is nice or over a covered area so rain doesn’t cause further problems. Other than that your RV rubber roof repair project should be quick, affordable and effective, allowing you back on the road in hardly any time at all.